Halloween is fast approaching, and we probably already know what happens during that time: children in their costumes asking for treats from their neighbors, costume parties, a release of horror films, and other Halloween-themed events. According to one survey, Halloween is considered the highest grossing holiday after Christmas, and that fact alone clearly indicates how popular this celebration is among people. Again, since Halloween is already just around the corner, it would probably be a good idea to put together a party for that day. If you are indeed doing so, then you might as well take advantage of what we have in this article. 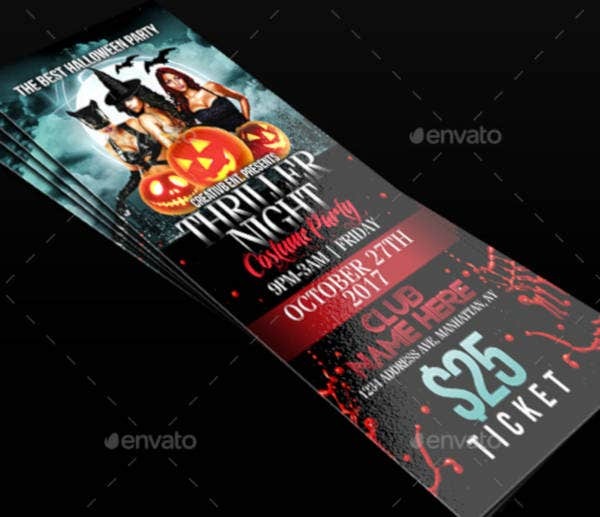 Below, we have a collection of Halloween event ticket designs and templates that you can download and use. These templates are ready to download, so go ahead and check them out yourself. 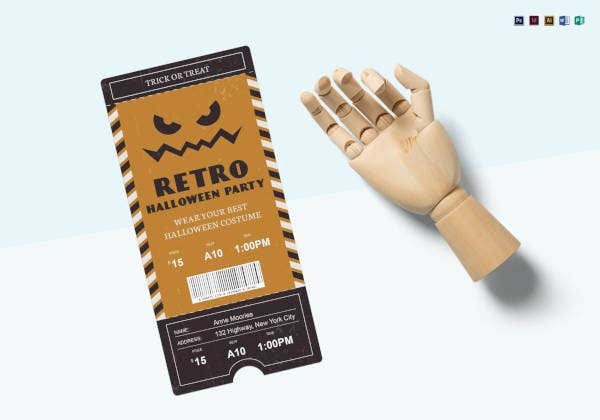 Make your party tickets creatively spooky by using this minimal yet adorable ticket template. The design on this template simply shows a gravestone illustration with a drawing of an eyeball in the corner. To add to the tone of this template, the design makes use of a sepia color scheme. For as low as $5.00, you’ll be getting easily editable vector files in the PSD format, and the text here is fully editable as well. 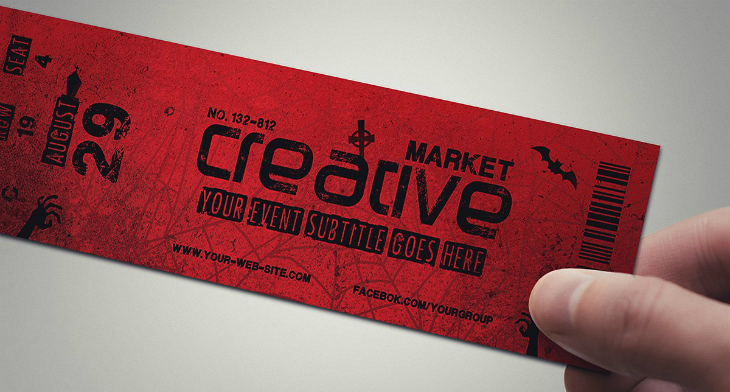 Take it a step higher on the scare meter with this creative ticket template. The color scheme of this template is enough to send chills down the guest’s spine, and with the addition of silhouette elements and cobwebs on the background, the more this template looks perfect for the occasion. Halloween (sometimes spelled as Hallowe’en), is also referred to as All Hallows’ Eve, All Saints’ Eve, or Allhalloween, is an evening celebration observed in many countries on the eve of October 31st. While most people think that Halloween is a one-night event, it is actually just the beginning of a three-day celebration to honor those who have passed, including saints and martyrs for the Christians. 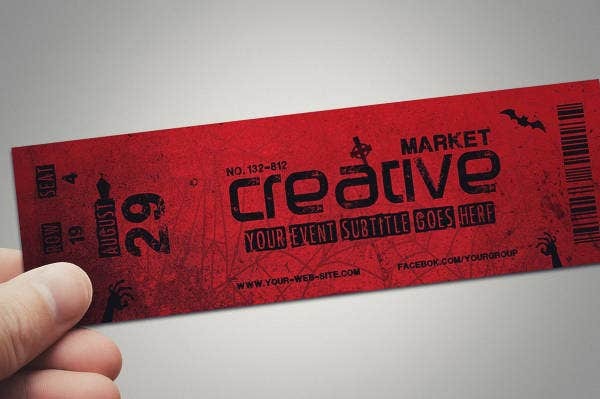 You may also like printable event ticket templates. Various activities take place during Halloween, and one of which is trick-or-treating, wherein children dressed up in costumes and knocked on their neighbors to ask for treats. Other activities that occur during Halloween include costume parties for grown-ups, carving of Jack-O’-Lanterns out of pumpkins, bonfire lighting, apple bobbing, horror or “haunted” house attractions, telling of scary stories, and watching horror films. You can also read ticket samples. In many Christian countries, they also have their own way of observing Halloween in addition to the ones previously mentioned, and this is by way of attending church services and lighting candles over the graves of the departed. In other Christian denominations, they also do abstinence during Halloween—not eating meat in favor of consuming only vegetarian foods. You may also see free ticket templates. 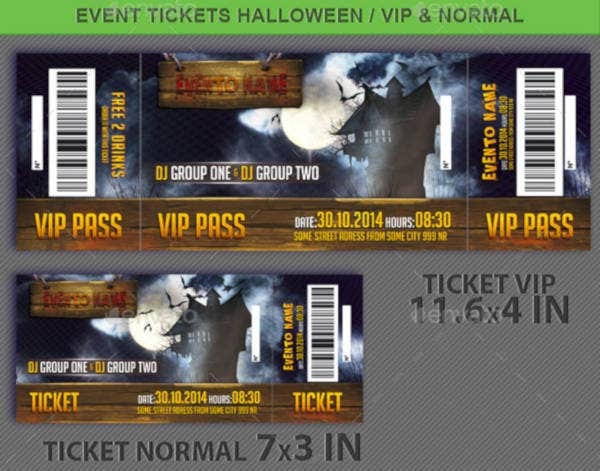 Want to design Halloween party tickets for both regular and VIP attendees? Check out the template above. As you can see, the VIP ticket has a bigger dimension than the ones for the regular guests. 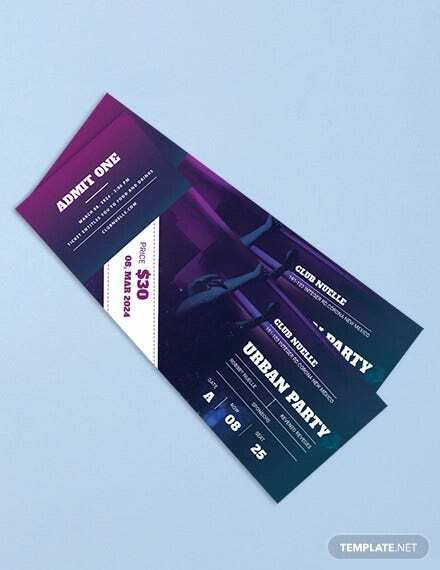 If you are looking for similar templates, you may also check out our collection of VIP ticket templates. 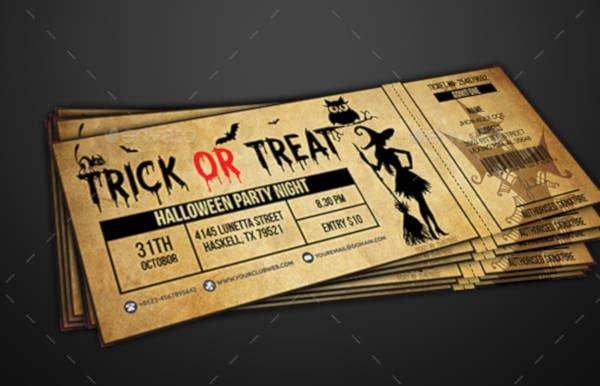 Here’s another sepia-styled Halloween party ticket template that you can also use for your events, but this one is landscape oriented as opposed to the last one that is portrait oriented. With this template, the elements can be rearranged and you are also allowed to add as much text as you need. There are various claims as to how the Halloween celebration originated, and one of which is the influence brought about by the Celtic cultures. According to many people, they believe that the customs of today’s Halloween is actually influenced by folk customs and beliefs from Celtic nations. One historian explored the origins of Halloween and believes that it is linked to the Celtic’s Samhain festival, wherein they believed that the ghosts of the dead came back to earth. You can also read Halloween coloring pages. Another culture that has influenced today’s Halloween customs is the Christian dogma and its practices. Since the Church’s early days, vigils were held a night prior to major Christian feasts, and the All Hallows’ Feast is no different than the others. During this evening and the two remaining nights—collectively referred to as Allhallowtide—the saints as well as departed souls who have not yet reached heaven are being honored and prayed upon. You can also like halloween photography ideas. During the 19th century, America experienced a mass number of immigrants coming in from Ireland and Scotland, with over millions fleeing their own country due to the Great Famine. Along with the immigrants is the Halloween celebration, and they also contributed to its popularization among the American population. By the 20th century, Halloween was already being celebrated across the country by people of all social, cultural, and ethnic backgrounds. You can also check out entry ticket templates. If you think that trick or treating is only for children, then you have gotten it wrong. Although trick or treating for grown-ups aren’t exactly similar to the one for children, the idea of dressing up and eating sweets is still there. 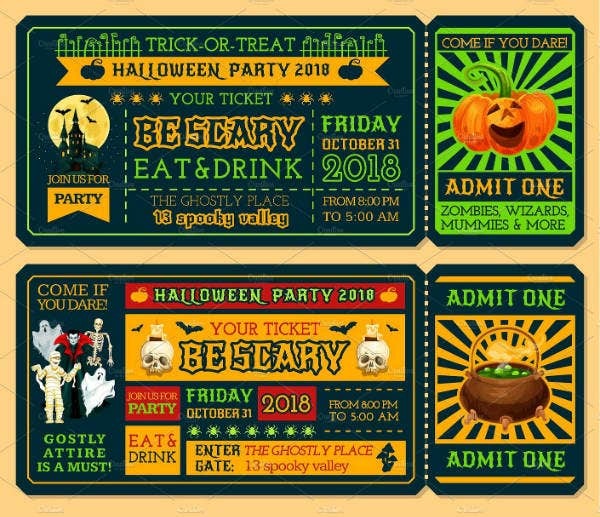 For the ticket template above, it makes use of a font that’s been personalized in order to fit a theme, and then a silhouette image of a witch is placed on the side. Download this fully editable PSD template, and get your hands on fonts for free. As mentioned earlier, Halloween comes with all sorts of parties for both young and old, with the young groups mostly going out and trick-or-treating. The grown-ups also have their own way of celebrating Halloween, and it could involve wearing costumes among the guests. There are multiple ways to celebrate Halloween night, and here are a few awesome ideas and elements to help make your Halloween party really exciting. You can also like halloween birthday invitations. Just like the horror movie genre, there are sub-genres that fall under it including monster horror, slasher flicks, and ghosts. For Halloween parties, they also have themes in order to make the event consistent. If you want to go for a ghost theme, then apply it not only on the decorations but also on the music, the food, and the overall ambiance of the party. Would you want the party to be kid friendly? Or would you rather make it for adults only and leave the children to their trick-or-treating? The reason behind this is so you can decide whether to serve alcoholic cocktail drinks, or to decorate the place with gruesome or gory elements. But then again, if you want to play safe, you can always go for a theme that’s appropriate for all ages. 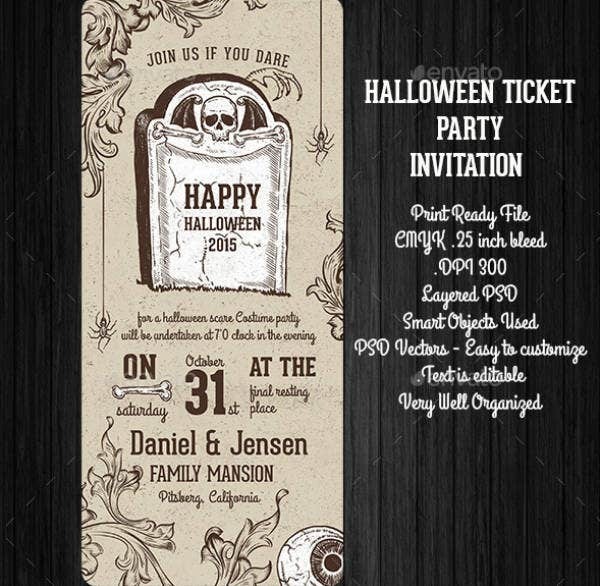 You can also check out halloween invitation templates. For adults, you may want to stick with some wine and cheese, and for children, some fruit juices, cake, and cookies. If ever you want this to be a dinner event, you may serve various dishes to your guests but serve them by parts or courses. Many Halloween parties for grown-ups take up most of the night, so you better conserve your food and beverage supplies well. You may also read halloween flyer templates. If you think that your pumpkins are only for making Jack-o’-lanterns, then you’re not thinking out of the box. Why not make your pumpkins into a serving bowl where you will be placing your dishes, candies, or even beverages. However, if you feel like this will become a hassle, then you can always buy plastic containers shaped like pumpkins in stores, go with those instead. You may alos read halloween wedding invitations. Of course, add some games into the mix to keep your guests engaged. There are a lot of Halloween party games that you can find all around the internet, find which ones are age-appropriate or are easy to pull off. This way, you’ll be keeping your guests from getting bored throughout the duration of the party. You may also see halloween cat templates. It’s not a new thing for people to add horrific twists to subjects that are supposedly intended for children, it creates something unexpected from something that’s filled with innocence. 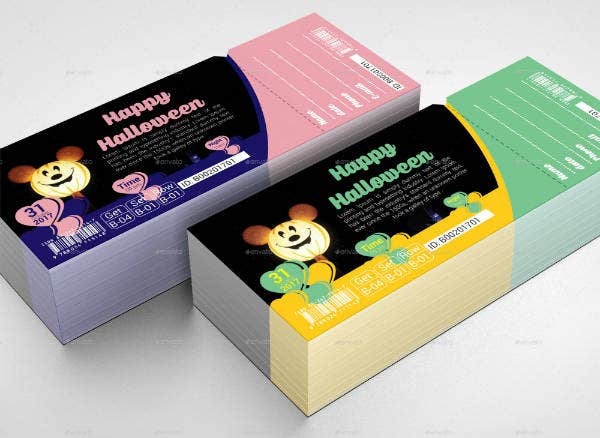 Whether that’s the reason why Mickey’s face is incorporated on the ticket’s design, or this template is simply intended for a children’s Halloween party, this would be a good choice for making your own party tickets. You may also like halloween birthday invitation templates. As discussed earlier, the observance of Halloween has had its origins from various cultures and traditions—one version even went back to mentioning the celebration’s pagan roots—and most of these had something to do with honoring the dead. But Halloween still holds tons of interesting facts that a lot of people still don’t know about, these are merely some of those facts. You can also see halloween powerpoint templates. The very first Jack-o’-lanterns were made from turnips instead of pumpkins. According to an Irish legend, the name of the Jack-o’-lantern was taken from a person named Jack, who was forbidden from entering both heaven and hell because he tricked the devil multiple times. Because of this, he had to wander the Earth eternally while misleading people from their paths using his lantern. 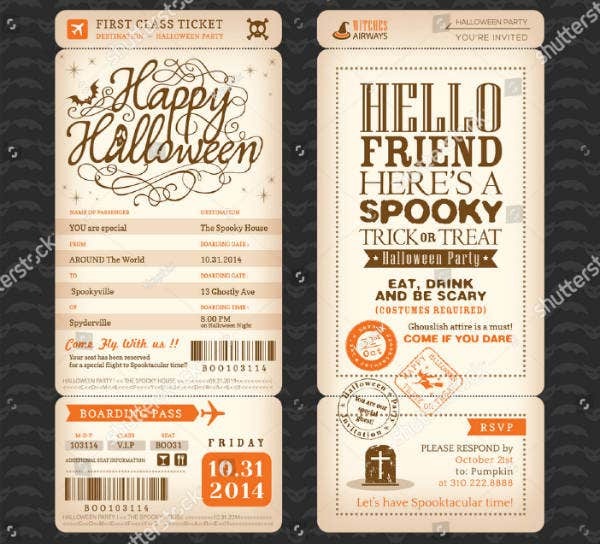 You may also see sample halloween invitation templates. Trick or treating originated as an ancient tradition of putting treats or food for the spirits who are roaming the streets during the Samhain festival. Many countries, including France and Australia, don’t observe Halloween, saying that it is an unwanted and overrated American practice. You can also read spooky halloween bat templates. In Mexico, instead of observing the three-day celebration, they celebrate their two-day Dias de los Muertos from November 1 to 2. 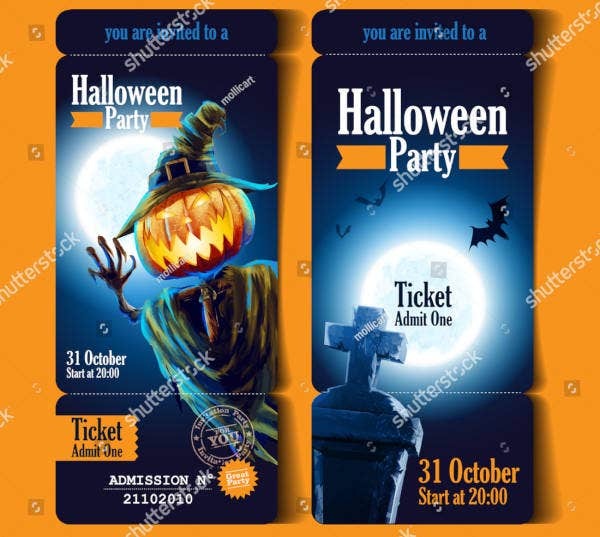 If you’re aiming to make your Halloween party enjoyable and spooktacular, then the admission ticket template above would fit your purpose perfectly. While this template seem simplistic because of its minimal use of graphics, the faux texture on the background and the color scheme help to make this design spooky. If you wish to use this as more of an invitation rather than a ticket, you may use the detachable stub for the RSVP.